The latest limited time event coming to free game "Fortnite: Battle Royale" splits players into five teams of 20 for a hectic fight to the finish. In a Teams of 20 mode launching March 8, players of "Fortnite: Battle Royale" are split into five competing teams, each of which contains five squads of four. Treasure chests and ammo boxes are now more likely to generate over the course of a game, while supply drops increase in rarity and matches are shortened from a maximum of 25 minutes to 23 minutes. Regular, limited time events such as this provide "Fortnite: Battle Royale" with the opportunity to experiment with new modes and features, while players are kept entertained with novel approaches to the game's core dynamic. In fact, the game itself started out as an experiment of sorts, as developers tried recreating the essentials of phenomenally successful, last-person-standing challenge "PlayerUnknown's Battlegrounds" within their own project. Launching in September 2017 across PlayStation 4, Xbox One and Windows PC, "Fortnite: Battle Royale" has characterized itself with a bright, cartoon aesthetic, regular limited time events, the ability to build (and destroy) fortifications, and the absence of an up-front price tag; instead, players can purchase cosmetic items for their character avatars, while a Battle Pass system provides additional bonuses over the course of a Season. 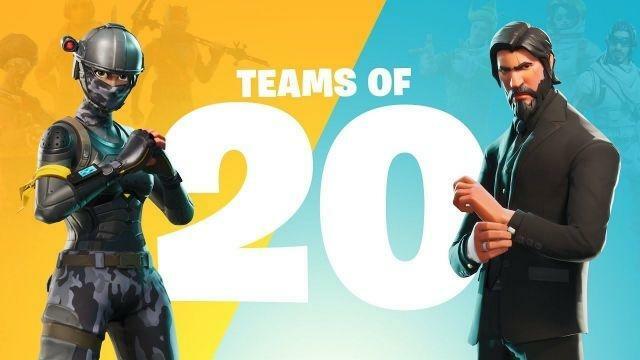 Unusually, developer Epic Games did not issue an end date for the Teams of 20 Limited Time Mode, which starts on March 8, 2018; December 2017's big 50 v 50 Limited Time Mode ran for a nine-day stretch.